Today many people have a real sense that something is missing in their lives! It is like there is a missing peace inside! The French philosopher and mathematician Blaise Pascal once said, “Inside the heart of every man is a God shaped vacuum waiting to be filled”. The beginning to resolving our quest for inner peace is to admit to ourselves that we need God. 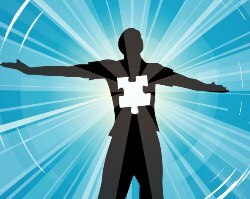 The Bible says that God created you and made you for relationship with Himself. He longs to be close to you! The Bible says that in the beginning the close relationship God had with Adam and Eve (the first humans he created) was broken because they sinned and wanted their own way. They lost that intimacy and closeness with God and all humans from that time have been born with sin. The Bible says, “All have sinned and fallen short of God’s glory”. The middle letter “I” in the word “sin” says it all – “I” want to be in control and “I” want to live my life my way. We are all basically selfish and self-centred. We need to “admit” that we have sinned against God and done many things wrong. We need to be prepared to turn from living a life of self centredness and surrender ourselves completely to God. Believing in God is not just an intellectual exercise but an act of faith in our hearts. Just like when we board an aircraft, we may not personally know the pilot or how the aircraft flies but by faith we simply step on board and look forward to arriving at our destination. The Bible also teaches, “For God so loved the world (that’s all of us in the world) that He gave His only son (that’s Jesus who died on the cross for all our sin and wrong doing). Whoever (that is anyone and everyone) believes in (that’s trusting in and committing to) will not die (that means the consequences of our sin debt has been paid for in full by Jesus) but have everlasting life (that means we have Jesus Christ in our life and will live forever with Him one day)”. This is incredibly good news. Jesus was born to die on a cross to pay for our sin debt. He conquered death and rose again. We need to accept this by simple faith and believe. If we ask Him, He promises to come into our lives by the Holy Spirit and fill up the inner emptiness with His life. 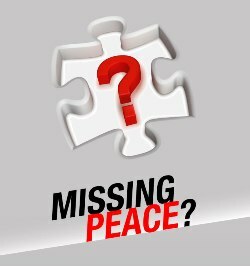 Jesus Christ is the missing peace. Commitment is an act of the will. Good decision making involves our will. You will need to affirm the following three things in order to accept Jesus Christ who is the missing peace in your life! 1. Do you admit your need of God and that you have sinned and are guilty before a holy God? 2. Do you believe and trust in what Jesus did on the cross on your behalf to pay your sin debt? 3. Are you willing to commit yourself completely to God and allow Him to take control of your life? The way we express our commitment to God is by prayer. Jesus said, “Ask and it will be given to you. Seek and you will find. Knock and the door will be opened for you”. Therefore, to receive Jesus Christ into your life, sincerely speak the following prayer out loud by faith. “Dear God, I know that I am separated from you and that Jesus is the missing peace in my life. I admit and confess my sin, my wrong doing and my guilt to you. I believe that you died on the cross for me and paid my sin debt and the judgment I deserve. I choose to turn from my sin and ask you to please forgive me and remove the guilt from my life. I choose to commit myself completely to you right now. I invite you to come into my life by the Holy Spirit and take control of me. Thank you for hearing and answering my prayer and coming into my life. Amen”. If you said that prayer and meant it, then by faith Jesus, who is called the prince of peace in the Bible, has come into your heart and life by the Holy Spirit! That’s good news! You now have found the missing peace! Here are four steps to help you to grow and develop in your new relationship with God. 1. Get hold of a Bible and read it every day to know Christ better, starting with Matthew in the New Testament. 3. Tell others what Jesus Christ has done for you. 4. Find a Church where Jesus lives and choose to be faithful in being part of that community to help you to grow. In conclusion why not say a thank you prayer to God for filling that emptiness and missing peace in your life!